KhoyaPaya.gov.in - Government Of India has launched new Web Portal by which you can find and help missing children from all over india. KhoyaPaya.gov.in web portal will help you to find missing/ found or sighted missing children. Check how you can find missing children, how khoyapaya.gov.in work. You can use Khoyapaya.gov.in or helpline number 182 to save missing child. Narendra Modi government is quite technology friendly government, one by one they are using technology to help indian people. Earlier, they made online attendance system, then Mygov portal to create bridge between people and government. Now, they come up with KhoyaPaya.gov.in Web Portal, which will help you to find missing children. This web portal will serve as central database of missing children from all over india. you need to register complain online for missing children (in case of missing) and if you sight any missing children, you may can find his/her information from this web portal. Why we need such web portal? As per current numbers, on average 44,475 children goes missing every year in india (As per National Human Rights Commission). And total of 4,913 children (2,352 boys and 2,561 girls) went missing in 2012. Every day 18 children goes missing in capital of india, Delhi Only. Child Trafficking is new big issue india is about to face. How this Khoyapaya.gov.in portal works? On the first visit, you need to register yourself with this portal. After filling basic details, you will get one time password on your mobile phone (this way your mobile will get updates on onwards missing kids). 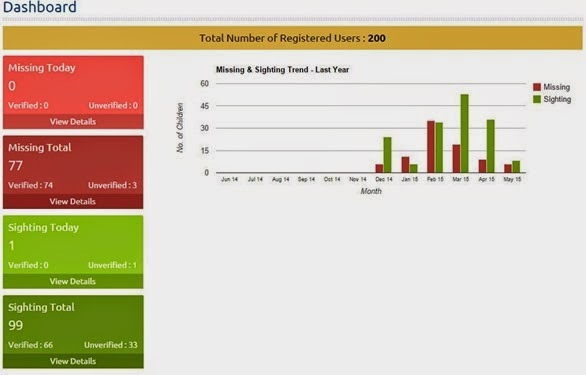 After logged in, you can raise complaint by providing basic information about missing children like his/her eye type, hair length, ear size, hair color etc etc.This way you can raise complaint about missing children on this portal. In case of you sighted any missing children, you can get access of missing children database after logged in. You can get photo of missing children, and you can search about missing children's by age, name and gender filter. Its a good initiative by Modi government, now parents who lost their children can easily find their children with help of two clicks. You can get reports of all over India missing kids on this portal's dashboard (after logged in). You can also access missing children database from your mobile, you can download khoyapaya Android application as well as windows application, install in your smartphone and find missing child. You can also call at missing child helpline numbers at 1098 (toll free) and mail them at nic-missingkids@nic.in.